I remember my first Spring as a Middle School teacher when I came in with literally SIX WEEKS left before testing and had more to cover than I could dream of. I had to make a plan and stick to it. While for the most part, I was getting support from my partner teacher I was still working day by day to stay ahead of my students. 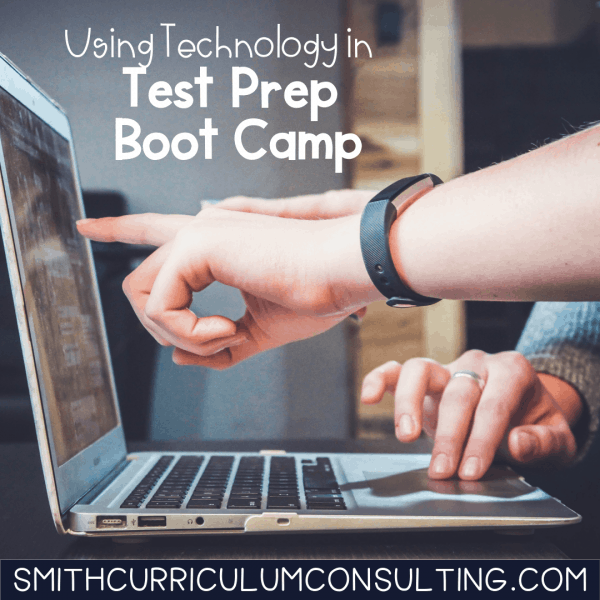 Why Test Prep Boot Camp? Because of the lack of structure, the class had all year they were seriously struggling and acting out in every way they knew how. The students had given up and therefore the class gave up. What was I supposed to do as a new teacher to them who they didn’t know and didn’t have a relationship with? I had to BUILD those relationships and the best way I knew how was in small groups. I broke my students into 5 groups, yes more than my traditional 4, and we broke down the standards needed for the next 6 weeks for some STAAR* BOOT CAMP. 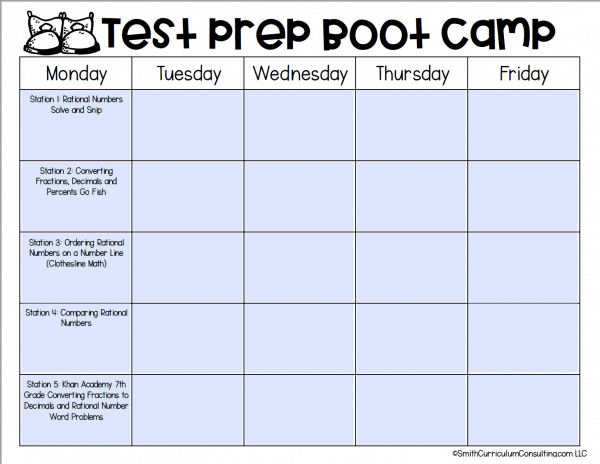 (*STAAR is the State Test in Texas) During Boot Camp each week we did 4 days of practice, rotating through activities and the 5th day was an assessment of sorts. This kept them up, moving and interacting with their standards. That plan started with a traditional calendar found on the internet but you can grab my Test Prep Planning Calendar for FREE. With this, I worked backward from the date of the test, blocked off assessment days and any other days that we wouldn’t be able to have Boot Camp and broke it down from there. I didn’t pull small groups like normal. Instead, I rolled around between four of the groups and kept checking in with them on what they were working on through the entire class period and providing teaching points as needed. The activities were for all four days meaning each activity they had for the day was to take the WHOLE period. On Monday, I started the class period doing a quick anchor chart for them to use throughout the week. I quickly learned to make a very bare bones poster and laminate first. This allowed my students to WRITE on the laminated area in dry erase markers and I could reuse it for the next class period. At the end of the week they hung up around our classroom like wallpaper and it was amazing. Tuesday through Thursday I was facilitating their work, going over misconceptions and listening. That’s the KEY POINT… take time to listen! Students were working, communicating about the concepts to one another and I was listening. I was able to let them take the lead and process their thoughts while they were working. When students take the time to talk with one another about what they are thinking they can grasp on to deeper understandings. As learners, we all internalize things differently and this allows students to take on the role of teaching others based on their understanding of the concept. Now, What About That Fifth Station? I didn’t have technology in my classroom but my students had it in their pockets. I found things online they could do from their phone (a lot of videos on Khan Academy since it was 2010 and there wasn’t much) and it made the world of difference. It allowed someone else to talk to them about the concepts they were learning. I had them follow a 3-2-1 Response for the videos they watched. This was as simple as 3 Things You Learned, 2 Things I Found Interesting and 1 Question I Still Have. That was it… it was simple and to the point and easy for them to complete. Now with the sheer amount of resources online for math, there are numerous websites that can be used in different forms for the Fifth Station. Even if you just have 2 weeks remaining until your state testing this year, YOU CAN DO THIS. Grab the Test Prep Planning Calendar, look at your standards that are tested and break it down to what is most important for you to cover in the time that you have left. 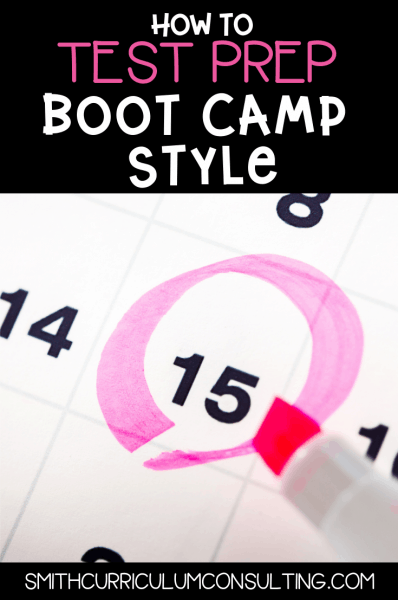 You can use the calendar to break down the 5 stations that you want to do each day or you can use the calendar to be a weekly plan for five weeks. It is extremely flexible and will allow you to use various items in your classrooms such as Solve and Snips, Spin to Win, Task Cards, Connect Four and so much more!